United Auctions held their Annual New Year Sale of Cattle & Sheep at Oban Livestock Centre. All classes of stock sold well at levels in keeping with current trends. £570 – Balvicar Farm : £550, £545 & £520(2) – Keill Farm. £77 – Hillcrest, Tiree : £63 – Gott Farm, Tiree : £61 – 4 Gott, Tiree : £59 & £56 – Gott Farm. £29 – Dunolliebeg Farm : £25 – Torloisk Farm & Dunach Estate. £75 – Achnacree Beag : £64 – Newfield : £48 – Strontoiler Farm. £72 – Barndromin : £56 – Ensay Farm : £52 – Barndromin. £54 – Ederline Estate : £50 – Croft One, Fanmore : £50 – Musdale Farm. £72 – Gott Farm, Tiree : £66 – 4 Gott, Tiree : £60 – Strongorm. £57 & £56 – Strongorm Farm : £56 & £54 – Gallanachmore. £47.50 & £42.00 – Corrylorn : £41.00 – Ederline Estate : £40.00 – Castles Estate. £64 – 3 Killean, Lismore. £63 – 4 Gott Tiree. United Auctions, Stirling: Thursday January 24 – sold 5,060 prime sheep comprising of 4102 prime lambs selling to an average of 192.6ppk & 958 ewes and rams. Lambs (4102) – Harviesmailing (BTex) £110.00; South Flanders (Tex) £110.00; Easter Bucklyvie (Suf) £96.50; South Flanders (Char) £96.50; Abercairny Est (Chev) £89.00; Abercairny Est (Mule) £87.00; Humeston (Cross) £86.00; Knock O Ronald (BF) £85.00. Lambs (4102) – West Park (Tex) 253.00ppk; Goddens (BTex) 251.00ppk; Goddens (Suff) 224.00ppk; Pityot (Chev) 215.00ppk; Ballycock (Char) 210.00ppk; Little Raith (Mule) 203.00ppk; Smithston (Cross) 197.00ppk; Luckenburn (BF) 195.00ppk. Ewes (958) – Humeston (Tex) £136.00; Mill of Inverarity (Suf) £80.00; Humeston (Cross) £81.00; Dougall Estate (Chev) £77.00; Cretlevane (BFL) £68.00; Easter Happrew (Mule) £64.00; Denside (BF) £50.00. Rams – Downfield (Tex) £99.00; Rossie (Cross) £83.00; West Balgothrie (BFL) £75.00; Easter Happrew (BF) £57.50. United Auctions, Stirling: Wednesday January 23 – sold 688 store cattle and also 134 cast cows. Bullocks (367) -averaged 214.21p to 246.50p per kg for a 284kg SimX from Gartincaber, and to £1340 for a 640kg AAX from Tanhill. Dairy Bullocks (60) – averaged 164.87p to 185.30p per kg for a 464kg MOX from Kirkmabreck, and to £860 for a 464kg MOX from Kilmabreck. Heifers (261) – averaged 205.91p to 237.00p per kg for a 354kg CHX from Auchenbothie, and to £1300 for a 647kg AAX from Crookedstonemuir. Beef Cows (119) – averaged 116.33p to 173.10p per kg for a LimX from Dalmarnock, and to £1210 for a LimX from Lochran. Dairy Cows (15) – averaged 103.75p to 122.50p per kg for a MOX from Meikle Camoquhill, and to £1090 for a MOX from Meikle Camoquhill. Bullocks: Up to 250kgs- Succothmore £475, 206.5p; 251-300kgs- Gartincaber £700, 246.5p; 301-350kgs- Gartincaber £770, Succothmore 245.1p; 351-400kgs- Auchenbothie £930, 238.5p; 401-450kgs- Cleugh £1020, Ochiltree Place 241.5p; 451-500kgs- Kirkland £1095, Hill 232.5p; 501-551kgs- Croftjane £1220, Mahaar 230.3p; 552-601kgs – Crookedstonemuir £1260, 215.8p; 602-651kgs- Tanhill £1340, 209.4p; 652-701kgs- Crookedstonemuir £1290, 187.5. Heifers: Up to 250kgs- Gateside £500, 203.3p; 251-300kgs- Gateside £645, 219.4p 301-350kgs- Sorn Mains £760, 235.0p; 351-400kgs- Auchenbothie £870, 237.0; 401-450kgs- Gateside £960, Balgray 221.4p; 451-500kgs- Gateside £1125, 227.7p; 501-551kgs- Crookedstonemuir £1170, 222.9p; 552-601kgs- Croftjane £1195, 211.1p; 602-651kgs- Crookedstonemuir £1300, 205.9. £ per head- Lochran (Lim) £1210, Dalachy (AA) £1170, Mount (Lui) £1070, Gateside (Sim) £1070, Forneth Livestock (SD) £1070, Gateside (BRB) £1050, Gateside (Sal) £1010. PPK- Dalmarnock (Lim) 173.10p, Tanhill (AA) 167.20p, Mount (Lui) 160.20p, Wardpark (Sal) 155.60p, Gateside (Sim) 143.10p, Forneth Livestock (SD) 131.80p, Gateside (BRB) 133.60p. £ per head- Gateside (BRB) £1430, Balthayock (CH) £1410, Drumoider (Sal) £1410, Gateside (Lim) £1310. PPK- Gateside (BRB) 167.10p, Dalmarnock (Lim) 158.60, Drumoider (Sal) 158.10p, Balthayock (CH) 152.60p. Dingwall and Highland Marts Ltd: January 23 – sold 647 store cattle, 49 adult head of breeding cattle 101 OTM cattle. Bullocks (400) averaged 212.2p and sold to 263.8p per kilo for a 235kg British Blue cross from Shewglie Farmers, Glenurquhart, and £1,295 gross for a pen of 629kg Aberdeen Angus crosses from South Balkeith, Tain. Heifers (237) averaged 212.9p and sold to 243.5p per kilo for a pair of 310kg Limousin crosses from Wester Tomloan, Ardclach, and £1,185 gross for a 580kg Charolais cross from The Cloy, Fortrose. Young bulls (7) sold to 222.8p per kilo for a pen of 368kg Limousin crosses from Strone Farm, Banavie, and £835 gross for a pair of 418kg Simmental crosses from Torran Farm, Delny. In calf cows (49) sold to £1,800 gross for a Limousin cross from the dispersal of 185 Migdale, Bonar Bridge. Cow with calf at foot (4) sold to £2,100 gross for a Limousin cross cow with a Limousin cross heifer calf at foot. Heifer with calf at foot (6) sold to £1,600 gross for a Simmental cross heifer with a Saler cross heifer calf at foot. OTM prime & feeding cattle (101) averaged 107.5p and sold to 166.0p per kilo for a 830kg Aberdeen Angus and £1,170 gross (4 times) for a 740kg, 900kg, 950kg and 910kg Simmental and British Blue crosses all from Hilton Farm. Bullocks up to 250kg – Shewglie, £620, 263.8p; 251-300kg – Wester Tomloan, £710, Strone Farm, 244.8p; 301-350kg – Lochbuie, Newtonmore, £795, Shewglie, 252.5p; 351-400kg – Upperton, Balnain, £980, 245.0p; 401-450kg – Dunain Mains, Inverness, £1,130, 253.9p; 451-500kg – Kinchyle Farm, Scaniport, £1,175, Druid Temple, Inverness, 251.6p; 501-550kg – Kinchyle Farm, £1,175, 230.8p; 551-600kg – Altyre Estate, Forres, £1,280, 217.0p. Heifers up to 250kg – 2 Achnagarrin, Rogart, £560, 225.8p; 251-300kg – Lochbuie, £700, 233.3p; 301-350kg – Wester Tomloan, £755, 233.0p; 351-400kg – Shawpark, Glaickmore, £830, Achley Farm, Maryburgh, 238.9p; 401-450kg – Kinchyle Farm, £990, Guisachan Farm, Tomich, 241.5p; 451-500kg – Achscrabster, Westfield, £1,020, 219.4p; 501-550kg – Hilton Farm, Tain, £1,100, 204.5p; 551-600kg – South Balkeith, £1,060, The Cloy, 204.3p. OTM prime & feeding cattle: Hilton Farm, (LimX), £1,110; Hilton Farm, (SimX), £1,030; Auchmore Farm, Muir of Ord, (BshX), £990; 2 Glaick, Ardross, (AAX), £970; Hilton Farm, (BBX), £950; Culmaily Farm, Golspie, (Lui), £890. OTM prime & feeding cattle: Hilton Farm, (SimX), 158.1p; Hilton Farm, (LimX), 150.0p; Altyre Estate, Forres, (SalX), 148.8p; Shawpark, Glaickmore, (CharX), 144.9p; Hilton Farm, (BBX), 128.6p. 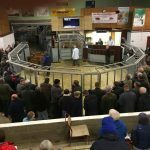 Caledonian Marts Ltd: January 22 – sold 1550 Prime Hoggets, Ewes and Tups. All classes of Hoggets sharper on the week, with the SQQ (39-45kg) averaging 202.6p for 706. Overall average for 1306 sold was 192p (+11.7p on the week). Top price of the day was shared by W M Bell & Son, Craigend, Perth & J B Guthrie, Cuiltburn, Muthill at £101 for 56kg Beltex. Top price per kg went to W M Bell & Son, Craigend, Perth at 230ppkg for a pen of 39.6kg Beltex Hoggets. Also forward were 244 Cast Ewes and Tups. Despite being a smaller show, all classes would be at similar rates to that of the previous week. Heavy Ewes averaged £70.51 selling to £100 for a Texel from G McGregor & Sons, Binn, Glenfarg. Light Ewes averaged £43.36 selling to £66 for a Cheviot from J A C Stewart, Kinninmonth, Ceres. Cast Tups sold to £86 for a Texel from I & G Farmer, Balbedie, Kinglassie. Caledonian Marts Ltd: January 21 – 439 Store Cattle. Bullocks averaged 205p per kg selling to 256p for a pen of Limousins from G Stewart, Wester Whin, Limerigg and to £1220 twice for an Aberdeen Angus from R & W Moffat, Bowridge, Carluke and also from A & J Orr, Hill O Harthill, Harthill for Limousins. Heifers averaged 192ppkg selling to 237p for a pen of Limousins from M L Wilson, Baluskie, Barrhill and to £1170 again for a pen of Limousins from M Campbell, Glenstockadale, Stranraer. 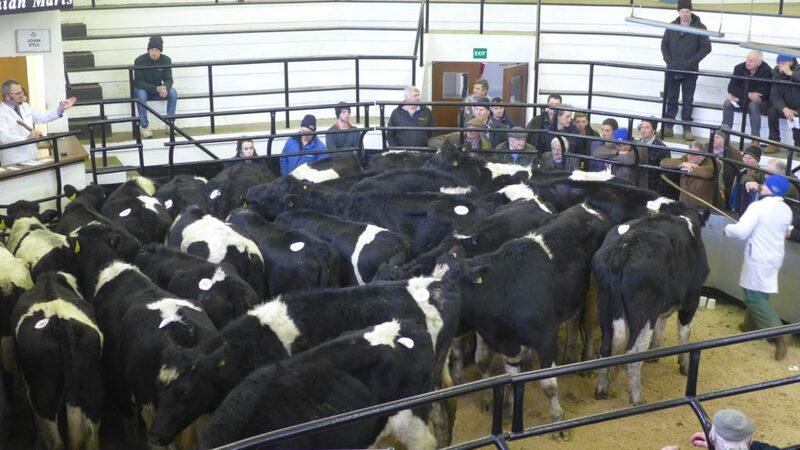 Black and Whites averaged 149p selling to 156p for a pen of 24 from D J & R D Neill, Kirminnoch, Stranraer and to £790 from the same home. Also forward were 1089 Store Hoggets, Ewes & Tups. All classes of Hoggets met the dearest trade this season, with 953 averaging £68.27 selling to a top of £89 from J Boyd, Dechmont for a pen of Texels.